I remember a time when webmail had limits of only a few megabytes for email boxes – those were back in the days when email traffic was a few a week and attachments were something you had to your high school classmates. Roll on to today and my Gmail inbox has close to 10GB of information it – plenty of that is in the form of attachments. There re three approaches to beating that bulk – the first is to judiciously prune emails and attachments, the second is to continually scale storage space (Gmail style) while the third sees attachments targeted as the evil mailboxes fillers. It’s this third strategy that Yahoo!Mail has just taken, partnering with YouSendIt to power the large file attachment application in Yahoo!Mail. 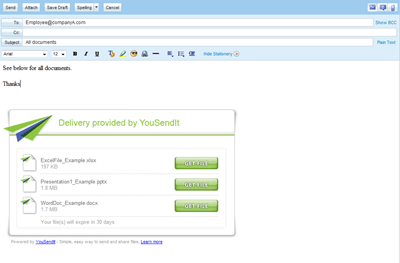 With the integration, large attachments within Yahoo!Mail will be handled directly by YouSendIt with users able to attach up to 100MB per email, securely and for free. In their release for this integration, YouSendIt released some interesting research conducted by Osterman Research, that found that 98% of all data that goes through email servers is attachments. It’s a nice integration, leveraging Yahoo’!Mail’s APIs to integrate YouSendIt seamlessly within the inbox – to use it, similar to attachments within Gmail, after attaching and sending a file, recipients simply click on a download button within the email to receive it. All files sent through YouSendIt are encrypted, and scanned by the system for virus protection. Of course it makes great sense for Yahoo – it saves them significant storage hassles. For YouSendIt it’s a great way to increase their profile and potentially upsell customers with additional security and tracking options. Users get to reduce the amount of data in their email accounts, and also have the ability to have added-value services within their own email. Of course inbox size is something that Gmail has got us used to not worrying about, tracking options are something that Gmail could introduce tomorrow and Yahoo isn’t exactly the sexiest company right now.